With the odds increasing that Congress will shut down the government this coming Tuesday, I couldn’t help but think of the classic Sci-Fi film, “The Day the Earth Stood Still” (the original version, of course). 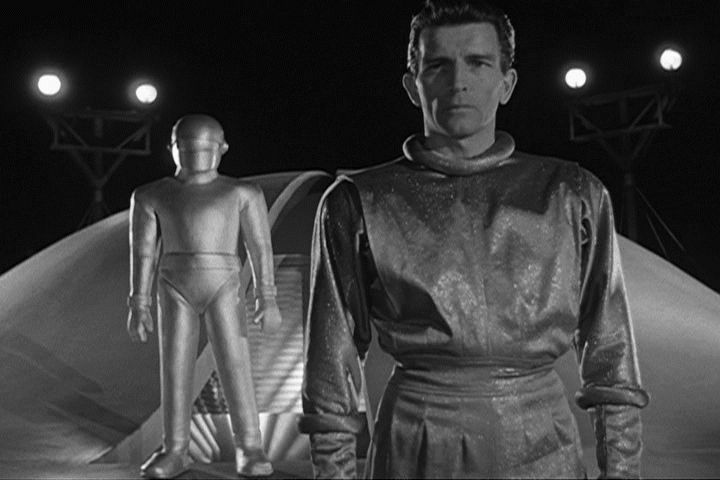 Remember Klaatu? He comes to earth in peace, only to be hassled, harassed, and ultimately shot by the authorities in Washington, D.C.
What angered Klaatu were the “childish jealousies” and “petty squabbles” he witnessed among earth’s leaders. “I’m impatient with stupidity,” he declared. And when it comes to this Congress, so should we all. So-called Obamacare is an expansion of medical care based on free-market models supported previously by Republicans like Mitt Romney. But the usual childish jealousies and petty squabbles are intruding as the Republicans in the House do their best to torpedo a plan that mostly favors the status quo. The stupid — it burns. Where is Gort when you need him? Kudos for citing one of my all-time fave flicks! I screened it again, for old time’s sake, within past week! I always make a point of referring to ACA as Romneycare, not you-know-who-care. Paul Krugman refers to GOP as “the crazy party.” (And oh, how the latter love to beat up on PK!) How long do we have to wait for these (dangerous) clowns to finally self-destruct? There are enough crazies in the voting population to keep returning them to elected office, unfortunately. NOTE: I in no way am suggesting an all-Dem government would be any kind of blessing. The root problem is “our” politicians don’t serve the people, they serve their corporate sponsors. Hmmm, maybe unleashing Gort really IS the only solution?